Commissioned by Customs House South Shields, and first performed there on the banks of the Tyne, now being re-run to celebrate the centenary of Simpson's death at Gallipoli 19-23 May 2015. 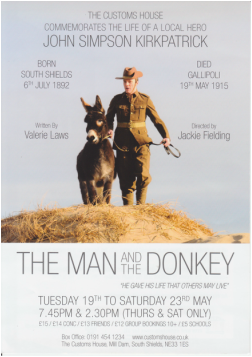 The play portrays First World War heroism, action, and friendship at Gallipoli, linking Australia and north east England, through the story of John Simpson Kirkpatrick, born in South Shields, still Australia's best loved war hero, who saved countless lives with the help of a donkey, and never fired a shot. A maverick, a 'Jack the lad', technically a deserter, impatient of army discipline and careless of danger, he gave his life aged 22 to help his wounded mates. Many in his home town don't know about him, despite the statue there: in Australia, there are statues of him and the donkey doing their life-saving work with wounded soldiers, in every state. The controversial campaign for a posthumous VC goes on to this day. South Shields audiences responded with tears, laughter, and standing ovations. Directed by Jackie Fielding, and starring Jamie Brown as Simpson.